GIF Studio is easy to use gif editor which lets you add static picture, sticker, emoticon or even your social network profile picture to an animated gif. If you are a fan of animation creation, you will love this new function. It gives your creation an identity and makes it unique and outstanding! Open “Sticker” screen. You can open “Sticker Screen” through the “Left Navigation Drawer” or from the top tool panel on the “Gif Playing Screen”. If you click the “Sticker” button from “Gif Playing Screen”, the current animation is added as the background gif automatically. As shown in the bottom of “Sticker Screen”, there are four buttons that used to configure the gif。 From left to right, they are “Photo Select”, “GIF Select”, “Swap” and “Save” buttons. 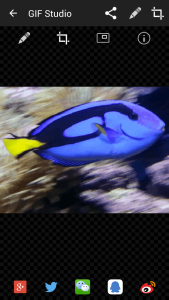 User can change the default gif and/or photo. 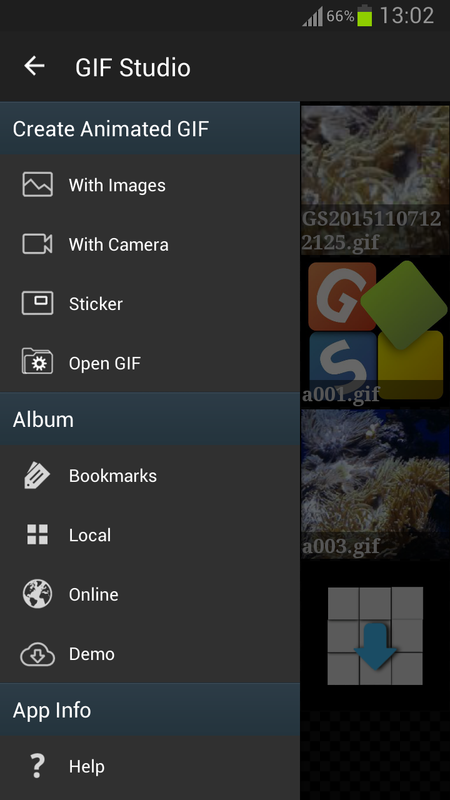 Press the “GIF Select” or “Photo Select” button to pop up the file chooser app available on the phone. Browsing through the directories to select the file you need. Note: if you pressed “GIF Select” button, make sure only gif file is selected. or the app will prompt you “Can’t open the file” message. This is to validate the file format before merge the photo and gif animation. 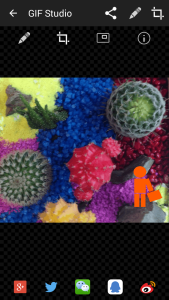 Moving the foreground image or gif to the desired position. 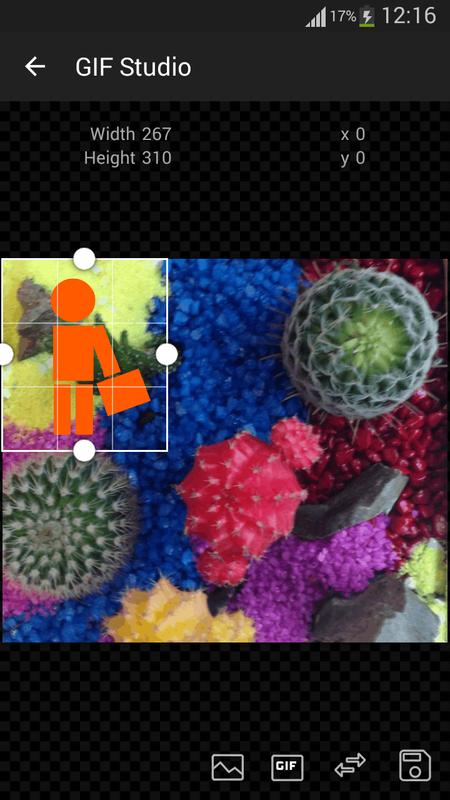 Scale the foreground image using the handlers/boundaries. User can also swap the gif and photo positions by press the “Swap fore/background” button. This button unifies two handy functions under one user interface: namely, add an animated gif over a static photo and add a static photo over an animated gif. To save the design, click “Save” button on the bottom right of the screen. 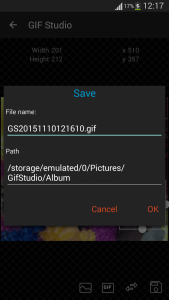 You can change the file name and directory on the “Save GIF” dialog. Then click “OK” confirm the action. Depending on the file size and the speed of the device, this may take a few seconds to a few minute. Click the “Home” button on the phone to switch to other activities. You will be notified after the process is completed. Share the design with your friends or do further editing. Do remember to like us, invite friends and give feedbacks on Google Play Store. Together, we make GIF Studio a better app! Good news is worth spreading! Now, you have a tool in your pocket. Remember to invite friends and give us feedback on the Google Play Store. 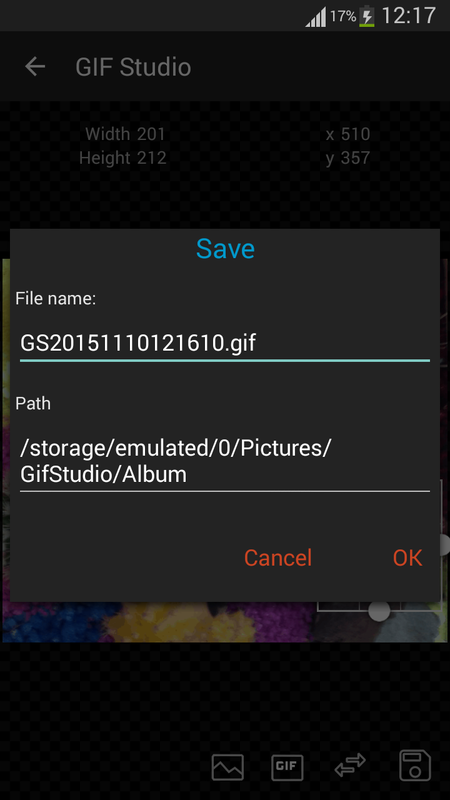 Together, we make GIF Studio a better application!